This waterproof golf bag with red camouflage print makes for an on the golf course for a cool look with a twist. This sporty and functional featherweight is one of the lightest JuCad Cartbags and the perfect companion in all weather conditions. The water-repellent bag Aquastop has many practical outside pockets with sealed zippers that keep your golf equipment dry at all times. 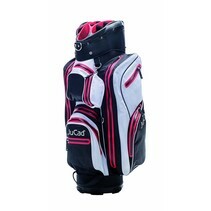 In terms of functionality, the rainproof bag has even more to offer: the continuous 14-compartment club layout with extra large putter tube, the spacious cooling compartment, as well as the practical umbrella holder guarantee maximum comfort on every round of golf!